Yesterday we popped in to town. E got some clothes, D got some shoes and I got a parking ticket. Boo! We parked up in the car park. T's bottom had exploded on the way into town so she was crying for me to change it and E was grizzling because T was crying. So D went to get the ticket from the machine and I set about getting the pushchair out of the car to make room to change T's nappy on the boot. I've felt a bit 'blah' for a few days (ladies 'stuff') and if you follow me on Twitter you'll know I've been grumbling about hot flushes. Well I suddenly felt this hot flush come over me and felt light headed and sick. D had got E out of the car and came round to stand next to T as I was sick by the side of the car. Needless to say, having been distracted by me, D forgot to put the ticket on the car, although I didn't realise. So off we went to do some shopping. 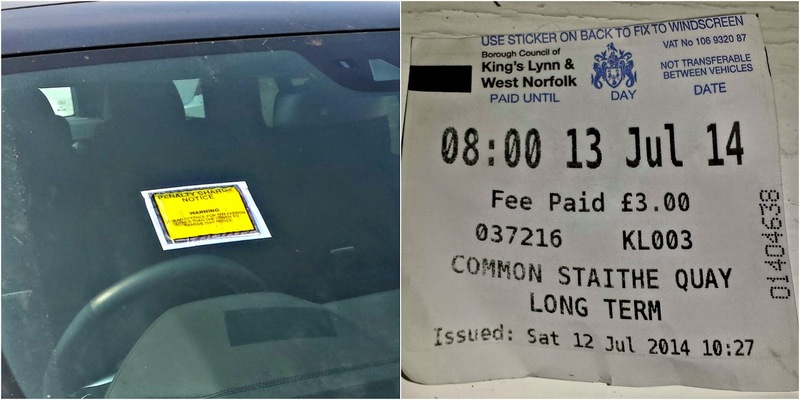 We picked up some food and E and I walked it back to the car, to find a ticket slapped on the windscreen. My first ever ticket. I couldn't work out where the ticket was, checked the car and couldn't find it. We went back to meet D and he found it.... in his pocket! Luckily we spotted the traffic warden and had a chat with him. and showed him the purchased ticket. He was actually very nice and helpful (2 words you didn't expect me to use describing a traffic warden, I bet?!) and told me how to go about appealing it. He said that if I explained the above to them and told them it had been purchased before the penalty ticket had been issued, that I had been ill and had two young children, he was certain they would cancel it for me. So I've just lodged my appeal. Wish me luck! UPDATE -14/07: In less than 24 hours I had a reply from them confirming my ticket had been cancelled! YAY!